Giving your bathroom a revamp can be a real investment that can transform the look and value of your home - but where do you start? And what do you need to make a great impression? TBKS will guide you through our top tips for giving your bathroom a complete overhaul in 4 easy steps. Before you go out and start bulk buying wall tiles, shower screens or chrome fixtures, the most important thing to do is get your homework done! Your layout should be planned as accurately and meticulously as possible; measure all the space available to you, make a note of any awkward pipework, electrics, and other idiosyncrasies to do with the overall shape of your room. This will make the installation of showers, baths, basins and radiators much less complicated than it needs to be. The smarter you are about the layout of your bathroom space and how you use it, the more money you will save. Finding a reasonable middle ground between form and function will help you steer clear of any extravagant expenditures and keep your project on the right track. 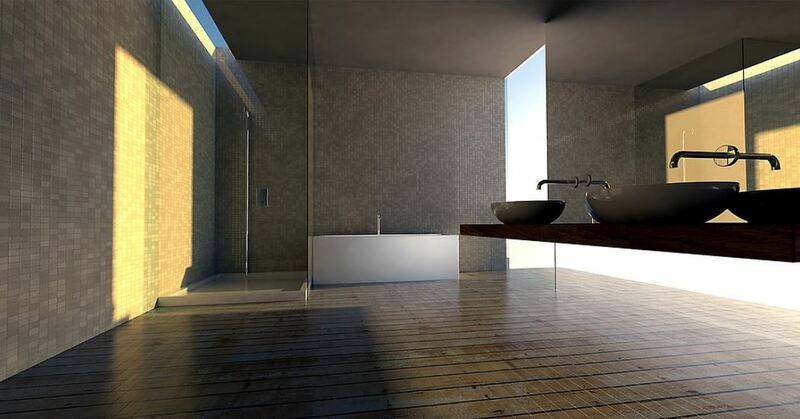 An overly design-led bathroom will be impractical and expensive and a bathroom that only considers function will be an incredibly bland and uninspiring space, offering no real value to your home at all. Splashing out on great quality taps, mirrors and other chrome accessories will instantly make a difference to your bathroom whereas stylish tiles can be bought for very affordable prices and other tricks like boxing in pipework can finish off your bathroom very effectively. Bathroom cleaning can be a time consuming job, but clever renovation planning will cut your tidying time in half if you do it right! Freestanding fixtures: TBKS stock a wide range of wall-mounted fixtures to keep your bathroom floor permanently free from clutter when you come to mop it. This Samuel Heath Wall Mounted Classic Toilet Brush Holder features a timeless, minimalist design that will suit practically any modern or classic bathroom theme you have in mind. Wall-mounted fixtures not only keep your floor clean, but make your bathroom appear bigger than it actually is, but the illusion doesn't stop there... Making use of large mirrors or reflective surfaces that wrap around the room will completely open up your smaller bathroom spaces. Bathrooms can also look smaller if you're making use of many different colour schemes so try and stick to one or two uniform colours to create more of an open, impressive space.